Carol Markusse, a successful business professional, was enjoying life with her husband and two children. Carol thought she had it all. She had obtained her undergraduate degree in business and later completed her Masters of Business Administration from Devry Institute of Technology in Calgary. Although her life seemed complete, Carol was unsettled and felt that something was missing. A few professionals she had been meeting with recommended she look into Distress Centre (DC). So in June 2016, Carol began her journey into counselling when she applied to volunteer for DC. After an extensive three-week training session and multiple observation shifts, she worked her first solo shift on the crisis lines in August. Carol is one of over 450 volunteers who responded to 75,215 crisis calls in 2016. To date the number of calls has seen a steady increase monthly since January and as of May 31st our highly trained volunteers have responded to 32,467 calls. Not only is Carol planning to continue on as a crisis line volunteer with DC, she is also in the process of developing her own social service club. The idea came to her after speaking with a senior caller who was very lonely. The caller had family but they rarely visited. The Social Service Club will pair families, including her own with a senior, and the family members will assist the senior with their needs. “If a senior needs their dog walked or if they’re lonely and just need a visit then the selected family can do those things for them,” says Carol. In addition to creating the Social Service Club, volunteering, and working two days a week, Carol has applied for her Masters of Counselling Degree, which she starts in September. “Working the crisis lines at DC gave me the opportunity to go to bed each night with the feeling that I made a difference in one person’s life. My experience has helped me find and pursue my true passion, which is counselling,” says Carol. 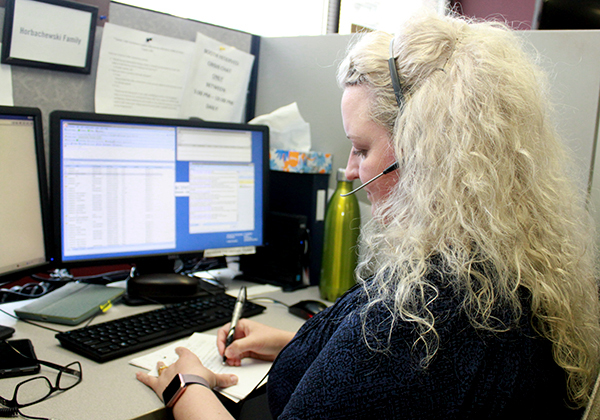 If you are interested in becoming a crisis line volunteer or ConnecTeen volunteer please see our volunteer opportunities to learn more.